Analyzing its first year of data, the Dark Energy Survey has demonstrated that weak lensing can probe cosmological parameters with a precision comparable to cosmic microwave background observations. Over the last decades, scientists have built a paradigm cosmological model, based on the premises of general relativity, known as the ΛCDM model. This model has successfully explained many aspects of the Universe’s evolution from a homogeneous primeval soup to the inhomogeneous Universe of planets, stars, and galaxies that we see today. The ΛCDM model is, however, at odds with the minimal standard model of particle physics, which cannot explain the two main ingredients of ΛCDM cosmology: the cold dark matter (CDM) that represents approximately 85% of all matter in the Universe and the cosmological constant ( Λ), or dark energy, that drives the Universe’s accelerated expansion. 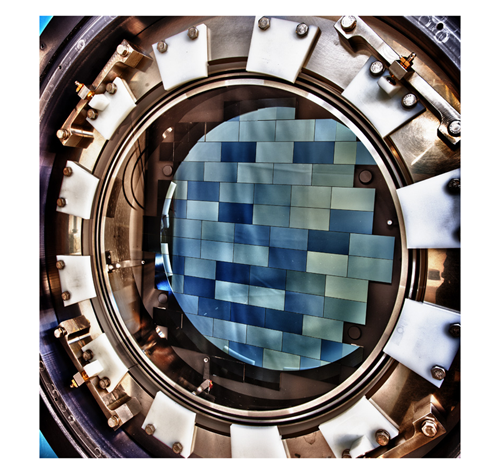 Figure 1: The CCD imager of the Dark Energy Camera (DECam) used by the Dark Energy Survey. DECam is mounted on the Victor M. Blanco 4-m-aperture telescope in the Chilean Andes. One potential way to sort out the nature of dark matter and dark energy exploits an effect called weak gravitational lensing—a subtle bending of light induced by the presence of matter. Measurements of this effect, however, have proven challenging and so far have delivered less information than many physicists had hoped for. In a series of articles , the Dark Energy Survey (DES) now reports remarkable progress in the field. Analyzing data from its first year of operation, the DES has combined weak lensing and galaxy clustering observations to derive new constraints on cosmological parameters. The results suggest that we have reached an era in which weak gravitational lensing has become a systematic, high-precision technique for probing the Universe, on par with other well-established techniques, such as those based on observations of the cosmic microwave background (CMB) and on measurements of baryonic acoustic oscillations (BAO). 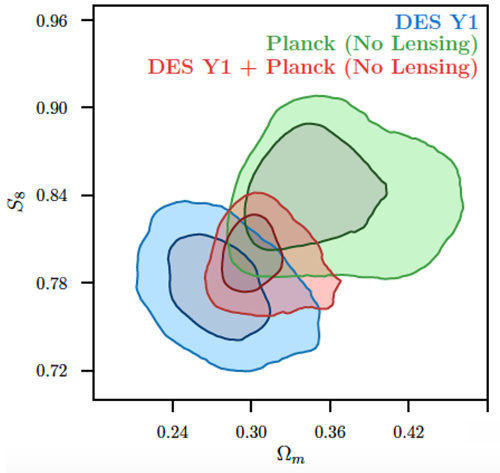 Figure 2: Constraints on cosmological parameters as determined by the DES (blue), Planck (green), and by the combination of DES and Planck (red). Within the measurements’ accuracy, the Planck and DES constraints are consistent with each other (Ωm is the matter density divided by the total energy density, and S8 is a parameter related to the amplitude of density fluctuations). For each color, the contour plots represent 68% and 95% confidence levels. Gravitational lensing is a consequence of the curvature of spacetime induced by mass. As light travels toward Earth from distant galaxies, it passes through clumps of matter that distort the light’s path. If lensing is strong, this distortion can dramatically stretch the images of the galaxies into long arcs. But in most situations, lensing is weak and causes subtler deformations—think of the distortions of images printed on a T-shirt that’s slightly stretched. Galaxies in the same part of the sky, whose light travels a similar path to us, are subjected to similar stretching, making them appear “aligned”—an effect known as cosmic shear. By quantifying the alignment of “background” galaxies, weak-lensing measurements derive information on the “foreground” mass that causes the distortions. Since dark matter constitutes the majority of matter, weak gravitational lensing largely probes dark matter. The potential of the technique has been known for decades . Initially, however, researchers didn’t realize how difficult it would be to measure the tiny signal due to weak lensing and to isolate it from myriad other effects that cause similar distortions. Most importantly, for ground-based observations, the light reaching the telescope goes through Earth’s atmosphere. Atmospheric conditions, optical imperfections of the telescope, or simply inadequate data reduction techniques can blur or distort the images of individual objects. If such effects are coherent across the telescope’s field of view, they can lead to subtle alignments that can be misinterpreted as consequences of weak lensing. Moreover, most galaxies are elliptical to start with, and these ellipticities can be aligned for astrophysical reasons unrelated to weak lensing. Despite these difficulties, several pioneering efforts established the feasibility of weak gravitational lensing. In 2000, several groups reported the first detections of cosmic shear . These were followed by 15 years of important advances, such as those obtained using data from the Sloan Digital Sky Survey , the Kilo-Degree Survey , and the Hyper Suprime-Cam Subaru Strategic Survey . , or about 3% of the full sky. They performed this mapping using two independent approaches. The first provided a direct probe of dark matter by measuring the cosmic shear caused by foreground dark matter on 26 million background galaxies. The second approach entailed measuring the correlation between galaxy positions and cosmic shear and the cross correlation between galaxy positions. Comparing these correlations allowed the underlying dark matter distribution to be inferred. The two approaches led to the same results, providing a compelling consistency check on the weak-lensing dark matter map. , within an experimental accuracy of a few percentage points. Such a value supports a picture in which dark energy is unchanging and equal to the inert energy of the vacuum—Einstein’s cosmological constant—rather than a more dynamical component, which many theorists had hoped for. CDM model, which could provide fresh hints as to what dark matter and dark energy are. The next few years will certainly be exciting for the field. DES already has five years of data in the bag and will soon release the analysis of their three-year results. Ultimately, DES will map 5000 deg2 , or one eighth of the full sky. The DES results are also very encouraging in view of the Large Synoptic Survey Telescope (LSST)—a telescope derived from the early concept of a “dark matter telescope” proposed in 1996. LSST should become operational in 2022, and it will survey almost the entire southern sky. Within this context, we can be hopeful that weak-lensing measurements will provide important insights into the most pressing open questions of cosmology. T. M. C. Abbot et al., “Dark Energy Survey year 1 results: Cosmological constraints from galaxy clustering and weak lensing,” Phys. Rev. D 98, 043526 (2018); J. Elvin-Poole et al., “Dark Energy Survey year 1 results: Galaxy clustering for combined probes,” 98, 042006 (2018); J. Prat et al., “Dark Energy Survey year 1 results: Galaxy-galaxy lensing,” 98, 042005 (2018); M. A. Troxel et al., “Dark Energy Survey Year 1 results: Cosmological constraints from cosmic shear,” 98, 043528 (2018). A. Albrecht et al., “Report of the Dark Energy Task Force,” arXiv:0609591. D. M. Wittman et al., “Detection of weak gravitational lensing distortions of distant galaxies by cosmic dark matter at large scales,” Nature 405, 143 (2000); D. J. Bacon et al., “Detection of weak gravitational lensing by large-scale structure,” Mon. Not. R. Astron. Soc. 318, 625 (2000); N. Kaiser, G. Wilson, and G. A. Luppino, “Large-Scale Cosmic Shear Measurements,” arXiv:0003338; L. Van Waerbeke et al., “Detection of correlated galaxy ellipticities from CFHT data: First evidence for gravitational lensing by large-scale structures,” Astron. Astrophys. 358, No. 30, 2000. H. Lin et al., “The SDSS Co-add: Cosmic shear measurement,” Astrophys. J. 761, 15 (2012). F. Köhlinger et al., “KiDS-450: the tomographic weak lensing power spectrum and constraints on cosmological parameters,” Mon. Not. R. Astron. Soc. 471, 4412 (2017). R. Mandelbaum et al., “The first-year shear catalog of the Subaru Hyper Suprime-Cam Subaru Strategic Program Survey,” Publ. Astron. Soc. Jpn. 70, S25 (2017). It’s worth mentioning that the data analysis used “blinding,” a protocol in which the people carrying out the analysis cannot see the final results, so as to eliminate possible biases towards specific results..
N. Aghanim et al. (Planck Collaboration), “Planck 2018 results. VI. Cosmological parameters,” arXiv:1807.06209. A research group led by Hiroshima University has revealed a picture of the increasing fraction of massive star-forming galaxies in the distant universe. Massive star-forming galaxies in the distant universe, about 5 billion years ago, trace large-scale structure in the universe. In the nearby universe, about 3 billion years ago, massive star-forming galaxies are not apparent. This change in the way star-forming galaxies trace the matter distribution is consistent with the picture of galaxy evolution established by other independent studies. Galaxies in the universe trace patterns on very large scales; there are large empty regions (called “voids”) and dense regions where the galaxies exist. This distribution is called the cosmic web. The most massive concentrations of galaxies are clusters. The formation of the cosmic web is governed by the action of gravity on the invisible mysterious “dark matter” that exists throughout the universe. The normal baryonic material one can see falls into the dark matter halos and forms galaxies. The action of gravity over about 14-billion-year history of the universe makes the halos cluster together. The location of galaxies or clusters in this enormous cosmic web tests our understanding of the way structure forms in the universe. Increasingly, deeper and more extensive observations with telescopes like Subaru Telescope provide a clearer picture of the way galaxies evolve within the cosmic web. Of course, one cannot see the dark matter directly. However, one can use the galaxies that are seen to trace the dark matter. It is also possible to use the way the gravity of clusters of galaxies distort more distant background galaxies, weak gravitational lensing, as another tracer. The Hiroshima group combined these two tracers: galaxies and their weak lensing signal to map the changing role of massive star-forming galaxies as the universe evolves. Weak lensing is a phenomenon that provides a powerful technique for mapping the changing contribution of star-forming galaxies as tracers of the cosmic web. The cluster of galaxies and surrounding dark matter halo act as a gravitational lens. The lens bends the light passing through from more distant galaxies and distorts the images of them. The distortions of the appearance of the background galaxies provide a two-dimensional image of the foreground dark matter distribution that acts as a huge lens. The excellent imaging of the Subaru Telescope covering large regions of the sky provides exactly the data needed to construct maps of this weak lensing. Dr. Yousuke Utsumi, a member of Hyper Suprime-Cam building team and a project assistant professor at Hiroshima University, conducted a 1-hour observation of a 4-deg2 patch of sky in the direction of the constellation Cancer. Figure 1 shows a close-up view of a cluster of galaxies with the weak lensing map tracing the matter distribution. The highest peaks in the maps correspond the foreground massive clusters of galaxies that lie 5 billion light-years away. To map the three-dimensional distribution of the foreground galaxies, spectrographs on large telescopes like the 6.5-meter MMT disperse the light with a grating. The expansion of the universe shifts the light to the red and by measuring this shift one measures the distances to the galaxies. Using spectroscopy places the galaxies in the cosmic web. The observations locate star-forming galaxies and those that are no longer forming stars. Collaborators led by Dr. Margaret Geller (Harvard-Smithsonian Center for Astrophysics) conducted spectroscopic measurements for galaxies. The Hectospec instrument on the MMT enables measurements of redshifts for 250 galaxies at a time. The survey contains measurements for 12,000 galaxies. The MMT redshift survey provides the map for the way all types of galaxies might contribute to the weak lensing map. Because the MMT survey provides distances to the galaxies, slices of the map at different distances corresponding to different epochs in the history of the universe can also be made and compared with the lensing map. The MMT survey provides a predicted map of the cosmic web based on the positions of galaxies in three-dimensional space. Research team compared this map with the weak lensing map to discover the similarities. Figure 2 shows that both the highest peak and the largest empty regions are similar in the two maps. In other words, the matter distribution traced by the foreground galaxies and the distribution traced by the Subaru weak lensing map are similar. There are two complementary views of the cosmic web in this patch of the universe. If they slice up the three-dimensional map in different redshift or time slices, they can examine the way the correspondence between these maps and the weak lensing map changes for different slices (Figure 3). Remarkably, the distribution of star-forming galaxies around a cluster of galaxies in the more distant universe (5 billion years ago) corresponds much more closely with the weak lensing map than a slice of the more nearby universe (3 billion years ago). In other words, the contribution of star-forming galaxies to the cosmic web is more prominent in the distant universe. These maps are the first demonstration of this effect in the weak lensing signal (Figure 4). The research team provides a new window on galaxy evolution by comparing the three-dimensional galaxy distribution mapped with a redshift survey including star-forming galaxies to a weak lensing map based on Subaru imaging. This research is published in the Astrophysical Journal in its December 14, 2016 on-line version and December 20, 2016 in the printed version, Volume 833, Number 2. The title of the paper is A weak lensing view of the downsizing of star-forming galaxies by Y. Utsumi et al., which is also available in preprint from arXiv:1606.07439v2. This work is supported by a JSPS Grant-in-Aid for Young Scientists (B) (JP26800103) and a MEXT Grant-in-Aid for Scientific Research on Innovative Areas (JP24103003). 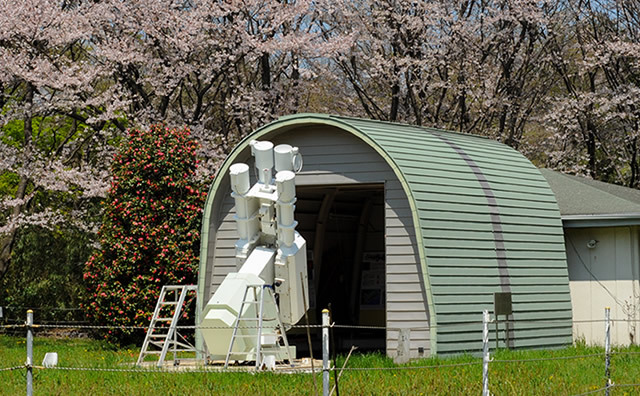 The National Astronomical Observatory of Japan (NAOJ) is an astronomical research organisation comprising several facilities in Japan, as well as an observatory in Hawaii. It was established in 1988 as an amalgamation of three existing research organizations – the Tokyo Astronomical Observatory of the University of Tokyo, International Latitude Observatory of Mizusawa, and a part of Research Institute of Atmospherics of Nagoya University. In the 2004 reform of national research organizations, NAOJ became a division of the National Institutes of Natural Sciences.